Promo version of Live 93, completely identical to the official release except for print on CD's "PROMO ONLY NOT FOR SALE"
- Copenhagen Trekroner, Copenhagen Water Festival party, 28th & 29th August 1993. - Tokyo, Club Yellow, 2nd July 1993. - Glastonbury Festival, NME stage, 26th June 1993. - Live Orbient, Mixed at Bunk, Junk and Genius Recording, London 3rd & 6th September 1993. Mix engineered GQ on the EQ. Live sound mixed on the Soundcraft Studio 24 track and Yamaha pm 3000. 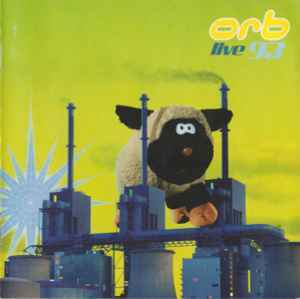 Performer [The Orb Live Are] Fluff, mentioned on this release, is actually the animal on the front of the sleeve. The Orb sample 'I Do Like To Be Beside The Seaside' taken from John Peel Session.